Charming applique cats quilt blocks with a definite St. Patrick's Day green theme. It's St. Patrick's week in Rolla, Missouri, home of Missouri University of Science and Technology and the traditional St. Patrick's Day-related celebrations tied to the Patron Saint of Engineers. The week-long revelry is much milder than when I first moved here, a good thing from my perspective but much-missed by some alumni who forget the rougher days of youth partying through the lens of nostalgia. The community gets ready for the festivities months ahead, and I was thinking about some of those crazy, fun details when I spotted these green cats quilt blocks - the town gets it's green on - and there's definitely a green theme to this cat quilt. This little cat reminds me so much of a head of broccoli, which I also love! The front paws and tail look like the broccoli florets I cut to steam! Love the detail in this applique cats, especially the white muzzle and fluffy tail. This little green cat makes me smile, wearing a little green tux so happy and welcoming. So maybe he's not wearing a tux but he has the attitude of one that is wearing one and his face is so happy and welcoming, like a little cat doorman. From our green town to yours, Happy St. Patrick's Day! Love to stop by and look at these toe shoes at Leach Theatre on S&T Campus, Rolla, Missouri. I don't have my pink toe shoes any more. I don't have some of my knees any more, either, a direct result of too many years trying to make my body do what it is not naturally designed to do as a ballet dancer. Our teacher was a tall, lean Russian. She carried a walking stick and used it to make sure we understood where our legs were supposed to be for a plie, or a jete. Because I was the tallest in the class, I was always in back and periodically was given a jumping part. The training served me well. I took to skiing without a fall and can still compensate for a lack of depth perception with the sense of balance ballet has given me. On the other hand, I have worn out my knee joints and will need to replace them at some point so I now happily settle for watching others wear out theirs. I was looking for a fishing quilt for a summer camp one year when I came across these ballerina lap quilt throws. I didn't hesitate. They are so simple yet elegant, I could see them either on a bed or as a quilted wall hanging in a guest bedroom where someone else would be practicing their dance steps for ours on end. Have to confess, I loved the fluffy tutus although pink was not my favorite color. I was partial to yellow although because of my brown hair, they usually gave me the pink one. My years of ballet inspired me to carry these elegant Ballerinas Lap Quilts Throws. These days I don't meet too many ballet dancers where I live, most young girls are tap dancers, hip hop artists or Irish dancers. I did meet a young woman at the theatre last week. She was standing in front of the glass case with the toe shoes so I stopped next to her. We smiled at each other. I asked her if she was a ballet dancer and she said yes. I nodded and we looked at the old, worn out toe shoes again and smiled. We don't tell anyone but yes, those toe shoes do hurt! 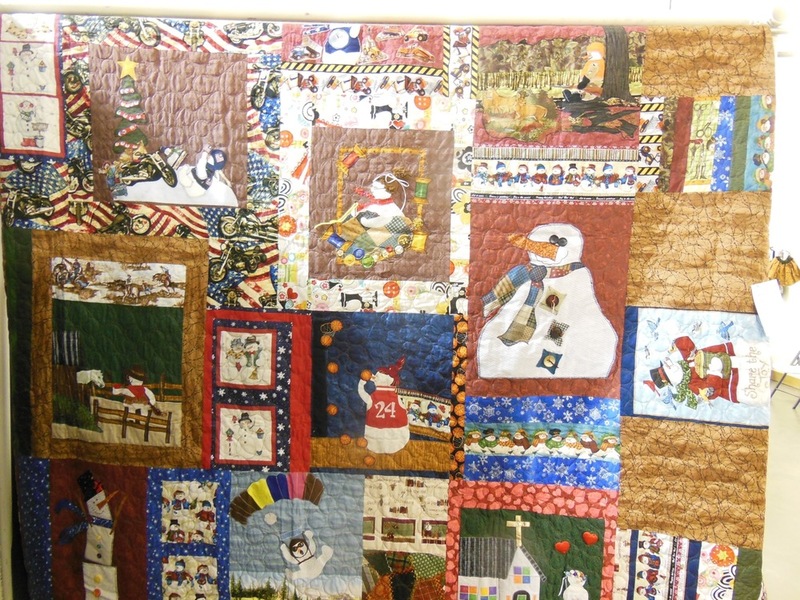 This handmade quilt was titled "Fun with Dresden Plates" by Cynthia Felts. Cynthia Felts machine pieced, hand appliqued and quilted this charming quilt. Nice job! I would be happy to have these flowers in my garden, wouldn't you? You have heard of redwork? I call this vintage child's quilt in blue and white blue work since all of the blocks were done in blue floss with a solid blue border. I found this quilt at the "Little Shop Around the Corner" in St. Louis. Vintage bluework child's quilt with "Home Sweet Home" embroidered in blue floss. Blue Work with Little Red Riding Hood as one of the 4x4 inch quilt blocks. Look at the hand-quilting, those are teeny tiny hand stitches! Another favorite saying "Home Sweet Home" in vintage blue work child's quilt. I can't imagine how long it took to embroider these blocks, some were very detailed. There was some wear along the edges and backing but this vintage quilt would make a lovely wall hanging in someone's nursery. An overview of how the 4x4 inch embroidered blocks looked together. Can You Guess How Many Hours to Make This Quilt? This is a quilt my neighbor Diane had someone quilt for her, she did the piecing. My neighbor Diane was very proud of her quilt and I can't blame her. The quilted wall hanging features curves and pointy end stars, two things that put fear in the heart of someone who is piecing a quilt. They can go so very wrong ever so quickly. The corner of my neighbor Diane's finish quilt hanging at the entrance to her home. Diane said the flying geese triangles gave her the most grief, probably from the curved design the triangles took throughout the quilt. Diane's quilt design features very detailed piecing work. Besides the corners, the pointed design of the piecing work was very intricate. Here the center also showcases the lovely artistry of the local quilter. Any guesses of how many hours it took to make this quilt? 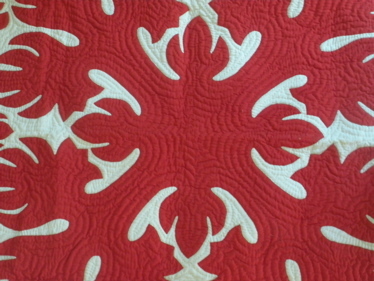 This is the center star of Diane's quilt and wall hanging. Diane guestimated at least 240 hours, she lost track in some of the work. That's at least one month if you were working on this full-time. As far as I'm concerned, it's priceless! One more peek at how quilts used to be made. Quilt frames were wooden structures that made it possible for homemakers to finish stitching the top and bottom fabrics, sometimes recycling another blanket in the center, together to make a quilt. With the advent of more time, and space, to quilt, some quilt designs became larger, such as this vintage full lone star quilt. When you lived out in the wilderness by yourself, quilt blocks tended to be smaller. It was more practical to make the individual blocks by hand, then sew them together to make the quilt top. Then a quilt frame came in handy. This one is part of the Home Crafts room at the Old Phelps County Courthouse Museum in Rolla, Missouri and included a quilt. Do you remember anyone in your family having a quilt frame? You would think it would be easy to find out the name of a traditional patchwork quilt. It isn't. Quilt names vary by several factors including where they were made, the age of the quilt and the experience level of the quilter. Some traditiontal patterns are the same wherever you go; double wedding ring quilts, log cabin quilts and irish chain patchwork quilts are among favorites. Do you have a favorite patchwork quilt pattern? Christmas may be over but it inspires me to start thinking about what to make for next year. The colors in this handmade quilt remind me of the colors in our Vintage Log Cabin Quilt, definitely Christmas colors with a little additional spice to them. 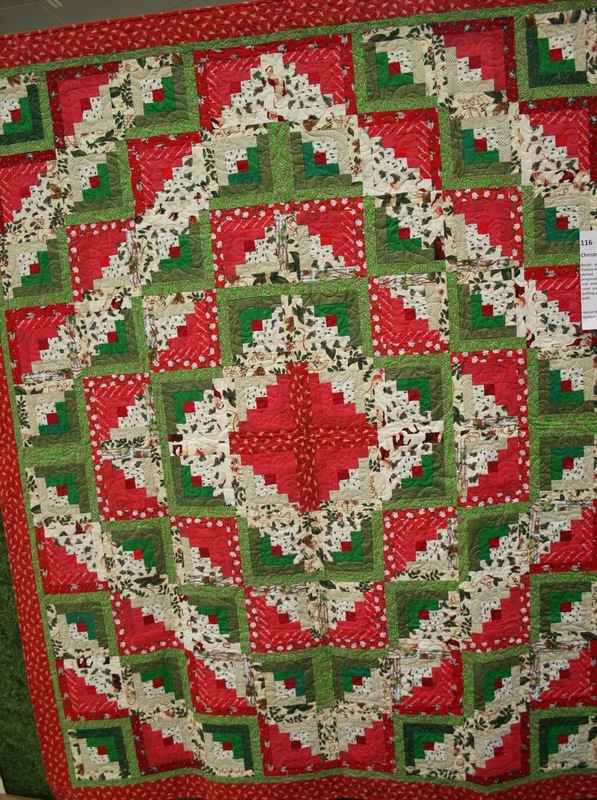 Christmas Log Cabin Quilt by fellow master gardener Harriet Bain makes me smile every time I see it. This one was on display at the 2013 Piece and Plenty Quilt Guild show in Rolla, Missouri. 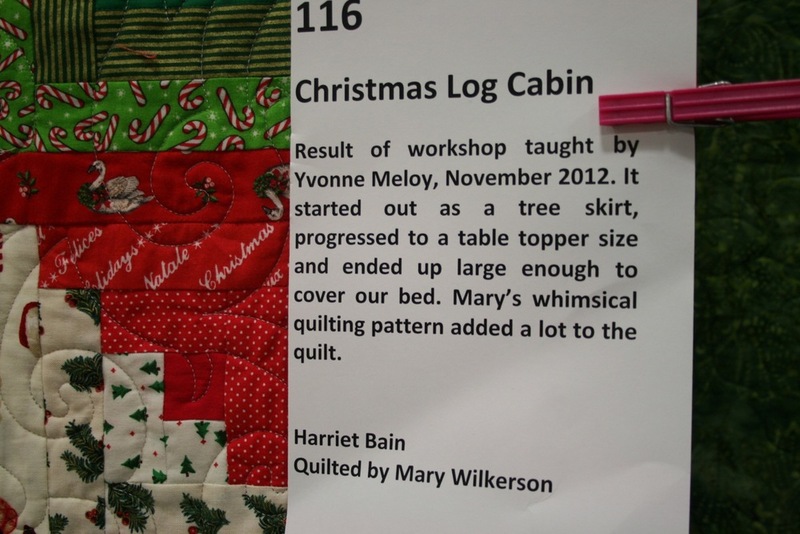 Sounds just like some of my personal projects, the traditional patchwork quilt started out as a tree skirt and literally grew from there! Quilt patterns tend to look different from different perspectives, especially log cabin quilt patterns. Up close, the fabrics prevail. From a distance, different-colored fabrics add to the overall design depending on whether fabrics are light or dark. Plenty of time to get one of these done for Christmas 2015. 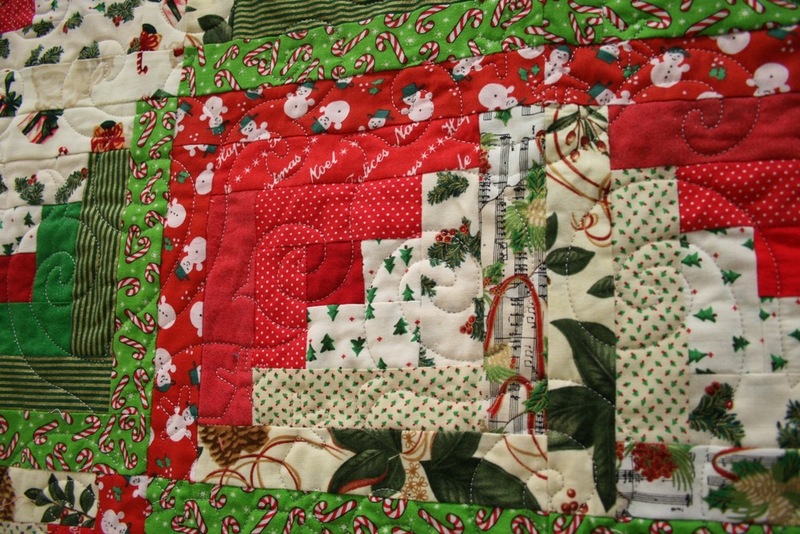 Have you made a log cabin patchwork quilt? 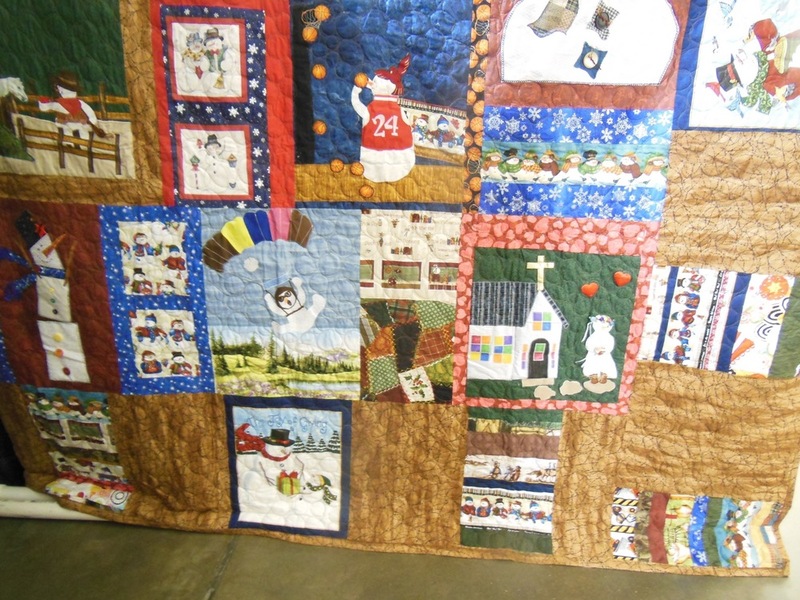 Inspired by the classic Christmas season movie "It's a Wonderful Life," this handmade Snowman 'It's a Wonderful Life" Quilt tells a different story. Pieced by Laura Cook and machine quilted by Rose Hamer, both with Gone to Pieces Quilt Guild, St. Robert, Missouri, this is an artistic quilt rendition of Kathi Crawford's life "as told by my Mom." There's a little bit of everything in this quilt from applique and patchwork to embroidery and collages. 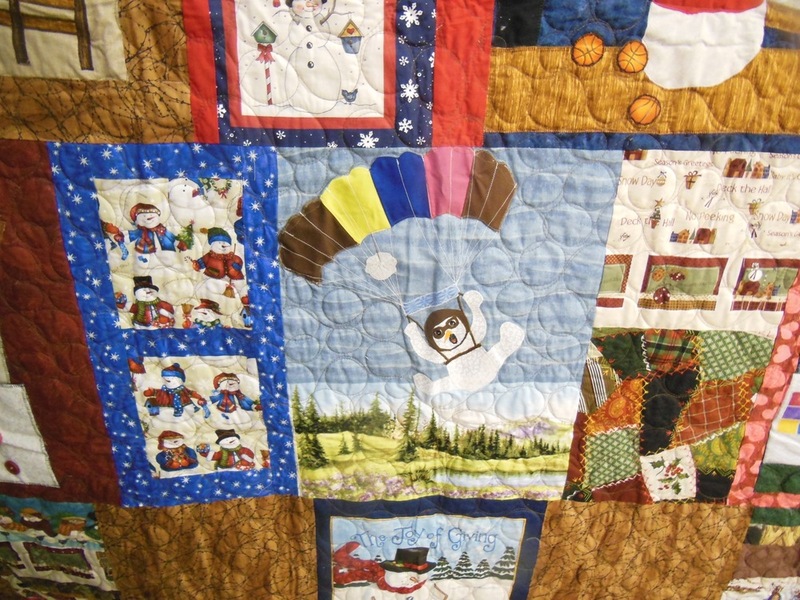 Yes, in this custom-made quilt the snowman - or should I saw snowwoman, is parachuting! All in all, it is a pretty wonderful life, don't you think? Sometimes when making a quilt from printed panels, you end up with an extra quilt block or two. In this case, we had two extra blocks, both too cute to pitch. We used the extra blocks to make a matching pillow for a quilt destined to become a nursery wall hanging. It's a reversible pillow, with a cat on one side, a dog on the other. To make sure the baby quilt lives a versatile life, we also added a 3-inch sleeve on the back so the baby quilt can easily be hung on a curtain rod. When not in use, the sleeve lays flat against the back and is almost invisible. Nothing like being cute, and practical. What would you do with an extra quilt block or two? Over the year, I have periodically repaired a variety of quilts, from museum-quality to well loved ones. None, however, where in the condition of this vintage Noah's Ark printed panel baby quilt, with a matching printed cotton on the back. When Dad contacted me about making the repairs, I said I was willing to look at the quilt to see if it was possible to salvage. The front was torn and worn; the back had several bad spots so we basically had to take the quilt apart and make a new one from the remaining pieces. Luckily I was able to find another matching Noah's Ark panel for the front and I pieced the best of the packing fabric into a new back, adding a very soft blue cotton on either side to protect the center pieces from wear. A little machine quilting in a similar pattern as the original, with the same polyfill, and the quilt was "good as new!" This customer contacted me in the fall wanting to make a special gift for a wonderful someone moving to Seattle. After discussing several options, I suggested having kids draw their own quilt blocks we could scan and print on fabric. After several months, I received a package of 5x7 inch cards, each with a special design.We settled on organic cotton with a tree pattern and a white solid cotton frame around each block. After outline quilting around each block with a small meandering pattern in between, the custom quilt was finished and ready to take it's wonderful good wishes to Washington State. When I first moved back to the US, everything was a "quilt" because it was the one word my siblings and I learned to use for bedding. Some of our customers use other words to refer to quilts so here's the definition of some of the most-used words. According to Webster's Dictionary, a handmade quilt is a "bed cover made of two layers of cloth filled with down, wool and stitched together in lines or patterns." Comforters are a "quilted bed covering," although some have told me it's a medium to heavy quilt that has been hand-tied instead of finished with machine or hand quilting. Bedspreads are "a cover spread over the blanket on a bed mainly for ornament," which can also be a quilt. Whatever you call them, handmade quilts are usually first thought of something that covers a bed, and can be much more! From who made the quilt to what fabrics and patterns are used, handmade quilts reflect the era in which they are made. They can also include the passion and artistry of the quilter as well as mark special occasions such as births, weddings and deaths. In Hawaii, quilts are cherished family heirlooms and rarely seen in public. Hawaiian families have their own unique family quilt designs, similar to coats of arms, and hand down both quilt patterns and quilts through generations. These stunning quilts, often in only two primary colors like red and white, beautifully reflect unique floral designs, and colors, of those tropical islands. One of the most beautiful handmade quilts are applique quilts. Applique is the process of cutting different fabrics into shapes, then sewing them into a pattern with even stitches either on the outside or invisibly. Applique is one of the most popular quilt designs second only to patchwork, which are geometric, repetitive designs out of a variety of fabric combinations. Applique takes patience, a lot of practice and is often used in floral quilts and throws. For years, handmade quilts did not have standard sizes. Quilters made their bedding to use up all available fabric instead of trying to match a quilt to a bed size. That's why handmade vintage quilts don't fit today's standard beds. Even through vintage quilts may not cover modern bed sizes, they work well as throws over the back of sofas, at the foot of a bed and as a quilted wall hangings. After being quilted, handmade quilts are finished with binding to "seal" quilt layers around the edges. Handmade quilts may also be edged with more detailed edging such as scallops, sawtooth or other fabric pieces that make a complimentary pattern around the outside edge of the quilt. This additional edging may not be included in the original quilt size. Handmade quilts are finished by either and quilting or machine-stitched patterns to seal fabric layers together. Handmade quilts are not usually reversible but I make our reversible whenever I can. Adding a solid-colored fabric or putting a pattern on the back side of the quilt easily and quickly gives you a second home decor look and gives you extra space to preserve memories through clothing, photos and other mementos. I also recommend you look at the back side of the hand quilted quilt to see how even the stitching is. The more even and smaller the stitches, the more experienced the quilter! Handmade lap quilts and throws are the same thing. Standard throws and handmade lap quilts are 50x60-inch and can be smaller versions of larger handmade quilts, or unique designs all their own. If your are starting to quilt, start with a throw size before tackling a larger bed size quilt. Throws and handmade lap quilts are also popular sizes for quilted wall hangings, lap wraps, car blankets and personalized gifts. Look for handmade throws and lap quilts with 3" flat sleeve on the back so they can easily be made into wall hangings. You can also add tabs or use quilt hangars to turn a quilt into a wall hanging. Here's to Whatever You Call Quilts! They are named for the way quilts are "patched" and pieced together into geometric designs. Changing a fabric color can complete change the design, which is part of the fascination of patchwork quilts. The first official unique North American patchwork quilt pattern was Log Cabin in 1872. Patchwork quilts once again become popular in 1970s during the Great American Quilt Revival. The basis of this movement centered on people beginning to take an interest and looking into their ancestors and family histories. The concept of a patchwork quilt design has recently morphed into other art forms. The concept of a patchwork quilt design has recently morphed into other art forms. The Appalachian Quilt Trails Project includes more than 24 states where patchwork quilt patterns are painted on the side of old barns. It all started in 2001 when Donna Sue Groves of Ohio painted a quilt pattern on her barn to commemorate her mother who had passed on. Norma Bradley designed the Earth Quilt, a garden in the shape of a patchwork design at University of North Carolina-Asheville. If you've found a box of quilts at an auction, chances are you have found a stash of vintage quilts. Vintage quilts are from at least 20 years old to less than 100 years old. Quilts older than 100 years old are considered antique. Quilts may last for several centuries depending on how they were made and how they have been preserved. Most vintage utilitarian quilts either fall apart from use or are re-purposed into quilt filling, pillows or other household items. For many years, quilts made out of pre-made embroidery flower and animal kits were considered to be vintage. Since renewed interest in quilting in the 1970s, embroidery and patchwork quilt kits are once again popular and no longer a good indicator of a vintage quilt. Quilt blocks made decades ago and now finally finished are not considered vintage. A quilt is dated by the last work that is completed on it. I recommend if you have incompleted family quilts, go ahead and get them finished. That way you can appreciate the work of your quilting relative and have a wonderful family heirloom. When finishing quilts, add the quilter's name and, if known, date the quilt blocks were made. If you are not sure how old a quilt is, check the back of the quilt and look at the quilting. Older quilts may have very detailed hand quilting with intricate quilting designs and very tiny stitches. Detailed, precise quilting is a sign of an experienced quilter who used their skills to make practical bedding and other items for their home. Sometimes the types of fabric used in a quilt can help date it. Quilts made out of feed sacks, for example, are from the 1930s and 1940s. If quilt fabrics look brand new, the quilt may be made out of new reproduction fabrics. Sometimes the quilt pattern can help narrow down the period in which the quilt was made. Some quilt patterns were not easily available or distributed. 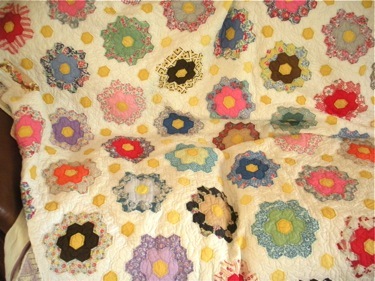 The best way to make sure you are buying vintage quilts is to buy them at estate sales and directly from quilters. 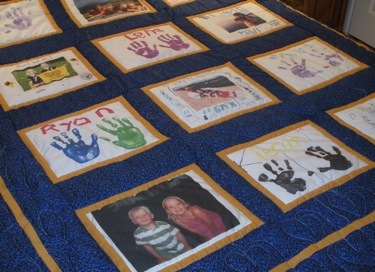 Custom Picture Quilts Wrap You in Memories! Photo memory quilts are a popular gift for a variety of occasions. We make a variety of custom photo memory quilts from custom quilts with just photos to custom quilts with photos, mementos and original clothing. Bluebird Gardens Quilt Design Service can help you easily design and make heirloom quality custom photo memory quilts with photos, original art, mementos as well as other memory items such as t-shirts and other clothing. Because we use the highest quality photo printing fabric on the market, both black and white and color photos will work for picture quilts and other photo memory items. Changing sizes from original prints can affect photo sharpness and color. By sizing them yourself, you can decide whether you still want to use a particular photo instead of struggling later if the photo doesn't work well. 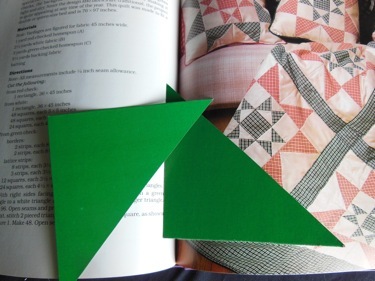 You can also use your scrapbooking pages to make custom quilt blocks (photo). You can also mix photos with other mementos and memorabilia to design quilt blocks. How Many Photos Can I Include? That depends on the size of the picture quilts and photo memory quilts, photo sizes and how many pictures you want featured per quilt block. You can use one photo per block. You can also fit two 3x5 or 2 4x6 photos per 8.5x11 quilt block, or arrange several photos to make a photo collage per block. To make the quilt design process easier for you, we use 8.5x11 quilt blocks, the same size as a standard sheet of paper. To give you a beginning reference, we'll show you photos of basic photo memory quilts and outline in general how many photos will fit on several favorite sizes of custom photo memory quilts. Can I Include A Patchwork Quilt Pattern? Sure can! We recommend keeping the photo memory quilt patchwork pattern simple so that it doesn't detract from photos, embroidery or whatever else is on the custom photo memory quilt. One good way to include a patchwork design in a photo quilt is to make sure photos have white space around them so they stand out from the rest of the quilt. In photo, we added a ninepatch patchwork design to the corners of the photo memory throw. If photos are taken inside and have a dark background, we recommend lighter color fabrics to set off photos. If photos were taken outside and have good lighting, dark colors in photo memory quilts will look good. Besides those guidelines, it's a matter of personal taste. We will discuss options and recommendations with you prior to starting your photo memory quilt. You are also welcome to send us a design, fabric samples or items that have the colors you want (photo). You can also select and send us your own fabrics. We can give you needed yardage and will discount the final quilt price. Can I Add A Special Date or Message? You can add poems, special messages, sayings, lyrics, company logos, unit crests as well as wedding, birthday and anniversary dates. The guideline we use for sizing any custom embroidery work is the larger the photos in photo memory quilts, the larger the font type size you should use. We will also recommend a font size. We can also make custom quilt blocks with your poem or other message printed onto the fabric. We can also embroider fabric and place your personalized custom message on the back of custom photo memory quilt. Can We Incorporate Art Work? Anything you can either scan or print can be included in a custom photo memory quilt. One of our favorite art to include in custom photo memory quilts is original artwork like children's drawings. Can I Include Clothing In Custom Photo Quilts? We can make memory quilts out of clothing such as baby clothes (photo) and incorporate clothing into custom memory quilts. Let us know what part of the clothing is important to incorporate into the overall custom memory quilt design. What Makes Your Custom Photo Quilts Different? The color matching we do with the overall quilt design and our high quality cotton fabrics make our photo memory quilts heirloom quality custom quilts. We also use Color Plus Fabrics designed and developed by a silk tie manufacturer. Color quality and permanent color retention are the best we've seen on the market. Can You Transfer Photos and Art Onto Fabric So I Can Make My Own Quilts? We certainly can! We recommend you send original art work and/or photos for best resolution and indicate whether you want the art work and/or photos printed vertically or horizontally. We also ask that you send us the actual photos you want printed. We will email you to confirm that we've received the art work and/or photos. Can I Wash Photo Memory Quilts? Because of the high quality photo transfer fabric we use, photos are permanently set and photo memory quilts can be washed. We recommend using cold water and low PH soap such as Ivory to preserve photo colors. Can I Put Photos On Finished Quilts? We've transferred photos to fabric and appliqued photos onto existing quilt designs. We've also incorporated photos into a design on quilts, lap quilts, crib quilts, baby quilts, pillows, shirt pockets and napkins. What you can do with photos is limited only by your imagination! How Do I Order Custom Picture Quilts and Photo Memory Quilts? You can send us your original concept on paper, as the customers in the photo did. (And yes, one of the designs was on the back of an envelope!) You can also call us at 877-598-1908 to discuss. We recommend you start by filling out our online quilt design form or email us the details of your picture quilts and photo memory quilts. That way we can think through your comments so that when we talk we can discuss options. We usually have at least one conversation with customers to cover specifics including cost prior to finalizing the photo memory quilt design and getting the picture quilts and photo memory quilts started. How Long Does It Take To Make A Photo Memory Quilt? Plan on 4 months. It usually takes 2-4 weeks to finalize details. The manufacturing process takes about 3 months; less for smaller quilts, more time for larger ones. The time starts counting once all details are finalized and a 25% down payment is received. Bluebird Gardens, 1001 Bluebird Lane, Rolla, MO 65401. If you send hard copy photos, we'll return them when we ship you the completed custom quilt. You can also email photos in jpg format to 4bluebirdgardens at gmail.com. A small additional fee may apply to cover the cost of downloading and setting up photos in the proper size and format. If you collect old handmade quilts then you've come across cutter quilts. Cutter quilts are well-loved handmade quilts that have stained and torn areas along with areas that are relatively untouched. Cutter quilts may also be missing pieces of filling or fabric in spots or on the back. These handmade quilts are no longer usable as bedding. Often fabrics have deteriorated enough that a couple more washings may cause further damage to the damaged quilt. Cutter quilts are usually sold at auctions at discount. When buying cutter quilts to make into other items, inspect it carefully to make sure there is enough fabric with integrity left so that you can sew the quilt pieces together. Cutter quilts can be a good buy to make into pillows, animals and clothing. Altering the original handmade quilt does change the value. If the cutter quilt is a family heirloom, making the quilt into other home decor items is a good way to retain memories associated with the original quilt. Make sure to add the name of the original quilter to the re-purposed quilt. That way family members will know the item has special family value. Cutter Quilts Are A Great Way to Recycle Memories! According to quilting historians, crazy quilts were a money-saving habit in Colonial times that became family tree memory quilts at their height of popularity in the 1800s. When Colonists blankets and coverlets started to wear, they were "cut down" and used in other handmade quilts and children's clothing. These early crazy quilts with random-fabric pieces were serviceable but not necessarily pretty. "Many were made to record family histories and pieces were gathered from many family members. Each piece would be embroidered with the name, birth date, death date (if needed) and an appropriate sentiment of the donor. Incorporated into it might be such things as a man's hat band, a leather bow tie and a piece of corset cover complete with lace." The "Cultivator and Country Gentleman" first used the name "crazy quilt" in 1878. It referred to an embroidered canvas cushion to be passed among friends. Pillsbury said "each would invent and embroider her own design, and when finished it was returned to its owner." As the article suggested, "You will think it a 'crazy" cushion indeed!" Charm and Friendship Quilts have been popular gifts for some time. To make them, a group of people get together and each provide either a couple of squares of fabrics for a charm quilt, or a completed pieced quilt block for what we've heard called friendship quilts. Although the terms can be used interchangeable, we will call charm quilts bed quilts with individual fabric blocks and friendship quilts bed quilts with individual patchwork pieced blocks. Called the queen of scrap quilts, charm quilts have each block made out of a different fabric. Charm quilts are one of the enigmas in quilt history. No one quite knows why they were originally made. Historians say they were popular in 1870-1900 but probably lost favor because it was so hard to collect so many different fabrics to make one quilt. The form resurged in 2000, when quilters around the country decided to make handmade quilts to celebrate the century mark. Called "Millenium" quilts, the same concept of having every block a different fabric were the hallmarks of these handmade quilts. Friendship Quilts are more complicated handmade charm quilts. Participants share pieces of fabric that they use to make a block or they contribute a completed, pieced patchwork quilt block. In the photo is a handmade friendship quilt made in Missouri in 1940 and pieced in 1961. (Yes, we know for sure. The provenance is hand embroidered on the border of the handmade friendship quilt!) I have seen both charm quilts and friendship quilts with people's names added to the blocks to personalize the bed quilt. We recommend that if you make a basic charm quilt with different blocks of fabric, use a solid cotton for the block with the name on it so the name can be seen and doesn't compete with the background pattern. I have seen a variety of charm quilt designs including various sizes of squares, flower garden, tumbling blocks, triangles and rectangles among others. The easiest design is a square. In our example, I am using 6x6 inch squares. You'll also need to decide on what kind of fabric and what theme you want such as patriotic, garden, pastels, etc. Part of the fun of making this charm quilt is working together to plan it. I recommend talking to your family, friends and neighbors to find the quilters among the group and get them excited about participating in this custom charm quilt project. Please send two 6x6 inch squares of 100% different cotton fabrics to each of the two people on the bottom of this letter. Copy the letter, moving my name to the left (replace the name that is there) and add your name on the right. We are following a theme of (gardening, patriotic, pastels) Thank you! Send the letter to a total of 7 friends, each letter with two 6x6-inch squares of the two different fabrics. If everyone responds, you should receive 84 different squares of fabric; adding the original two you kept, you will have 86 squares to make your own charm quilt. If you want to personalize your charm quilt even further, have each person who sends you fabric embroider their name or sign a block with an indelible ink pen. Like anything else, handmade quilts are collectible but how collectible, or valuable, depends on several factors. Handmade quilts are collected for a variety of reasons including pattern, color, history, quilt maker, memories. Most private collectors save handmade quilts because of memories. They were made by a grandmother, mother, other special family member. Favorite handmade quilts include fabrics remnants from favorite clothes. Or each quilt block was made by a different friend. Maybe the handmade quilt marked a special event, such as a wedding, anniversary, graduation. Bottom line is, looking at a handmade quilt brings back wonderful memories. People also collect handmade quilts based on favorite quilt patterns and designs such as red and white quilts and double wedding ring quilts. Some collectors specialize in fabrics. Handmade quilts made by a certain family, or areas of the country, can also be collectibles. All-time favorite handmade quilt patterns over the years include crazy quilts, Baltimore Album quilts, and double wedding ring quilts followed by applique floral quilts. Some focus on collecting handmade quilts connected with a major historic events or historic tie. Civil War era quilts are highly valued because few survived. 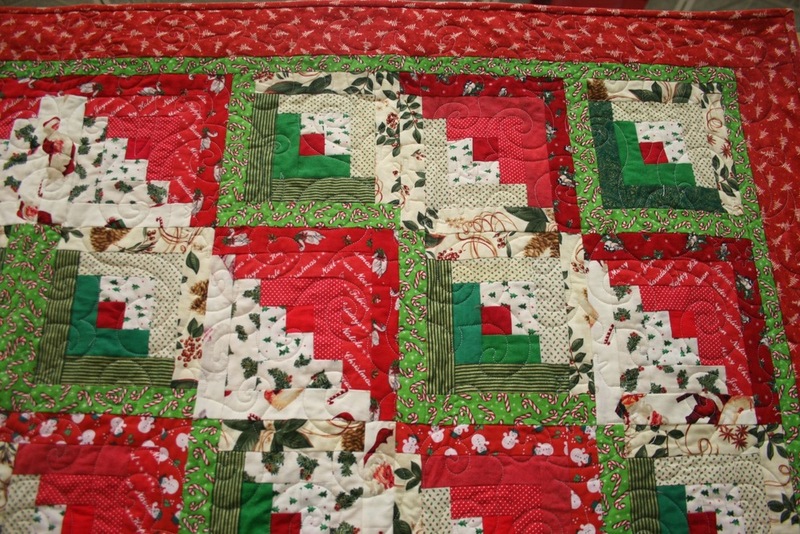 Handmade quilts usually associated with a family history are also collectible. When an interesting quilt design is added to the mix, along with who made it, the handmade quilt's value increases. Feed sack quilts from the 1930s (photo) have become collectible because they were utilitarian quilts used every day so few survived. These practical handmade quilts made during the Depression were recycled flour, sugar and other "feed sack" materials made into handmade bedding, clothing and even underwear. How Much Are Handmade Quilts Worth? Determining value is a combination of craftsmanship, age, uniqueness and overall appearance. It's also when the latest work was completed on the handmade quilt. Those vintage quilt pieces that you finally make into quilts will date the quilt from when you finish it, not from the date of the original pieces. The easiest way to value handmade quilts for insurance coverage is to keep receipts of what you paid. If the handmade quilts are family heirlooms, try to find similar handmade quilts for sale on online auction sites to determine a possible comparable value. There are also appraisers who specialize in valuing handmade quilts. Make sure they are honest, experienced and recommended. It's also a good idea to take photos of your vintage and handmade quilts and keep photos in a safe deposit box with whatever other information you have on the quilts: who made it, when, where, how you got it such as through purchase, gift, etc. It's also helpful to have the name of the quilts but remember quilt names do vary across the country. I do not offer quilt appraisals.